Digi-Max2™ is a brand new and significantly improved version of the original and very popular Digi-Max™ system. The 2nd Generation Digital Wireless (DW) camera / reversing camera system, features the very latest technology, with improved frame rates, resolution and many additional features (see below). 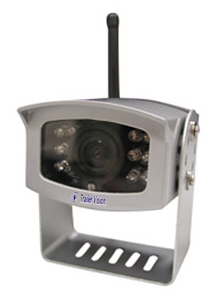 The system includes everything you will need to operate a wireless camera / reversing camera system with a HGV (24V), motorhome, horsebox, car/caravan, or trailer (12V). The system being DW, means that it can be used at the same time as Bluetooth devices, or wireless networks, interference free. The colour LCD monitor can be used with up to 4 cameras, including a reversing camera. The monitor can also show the images from multiple cameras at the same time (Quad View), as well as manual camera selection. Mains adapters can also be supplied (at an additional cost) to enable the system to be used in your home/site etc (200m 'line of sight' range). 1. Digital Wireless Wide Angle Lens Waterproof Camera / Reversing Camera (with Night Vision). 2. Digital Wireless 7 inch Colour LCD Monitor. 3. Windscreen mount for LCD monitor. 4. Camera mount & power cable (12/24V). 5. Vehicle power supply for monitor (cigarette lighter adaptor & hard-wire adapter). 6. Trigger cable (connect to reverse circuit etc for automatic display). Wireless Wide Angle Lens Waterproof Camera (also works in the dark).